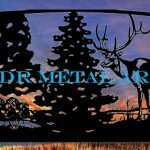 aluminum metal art gates Archives - Custom Driveway Gates - Iron Steel & Aluminum - JDR Metal Art - FREE Standard Shipping! 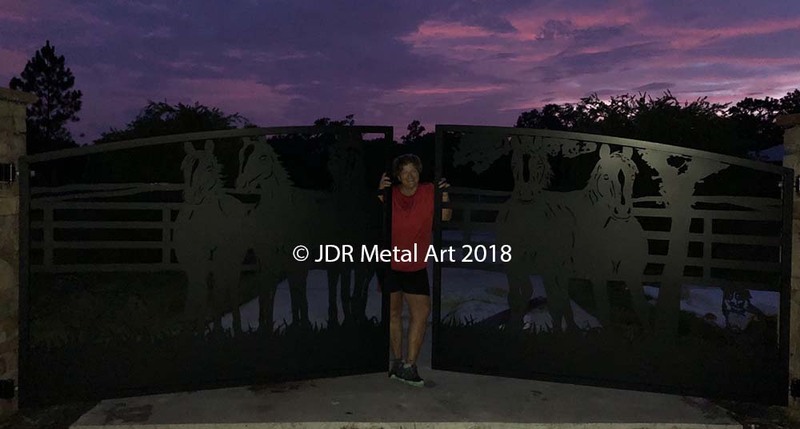 JDR Metal Art builds driveway gates for horse farms and ranches nationwide. 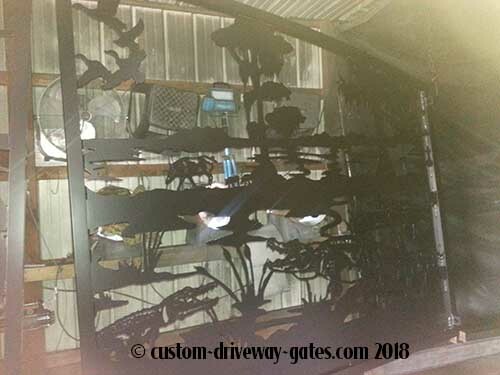 These 14′ dual swing driveway gates are going to an equine farm in Ocala, Florida. 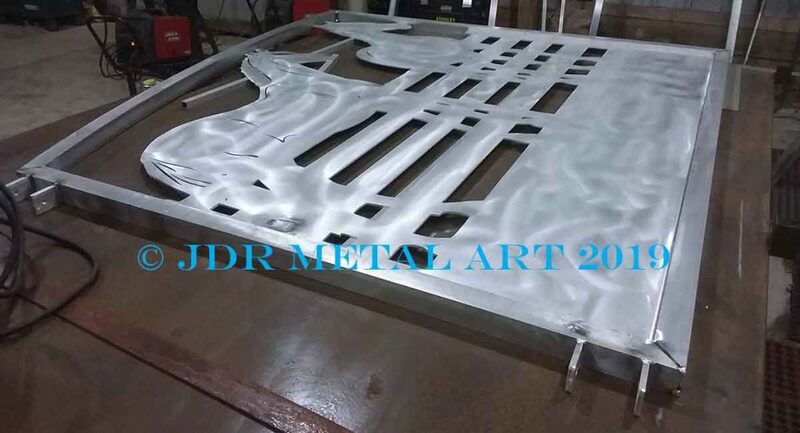 These gates designed & manufactured from marine grade aluminum by JDR Metal Art. 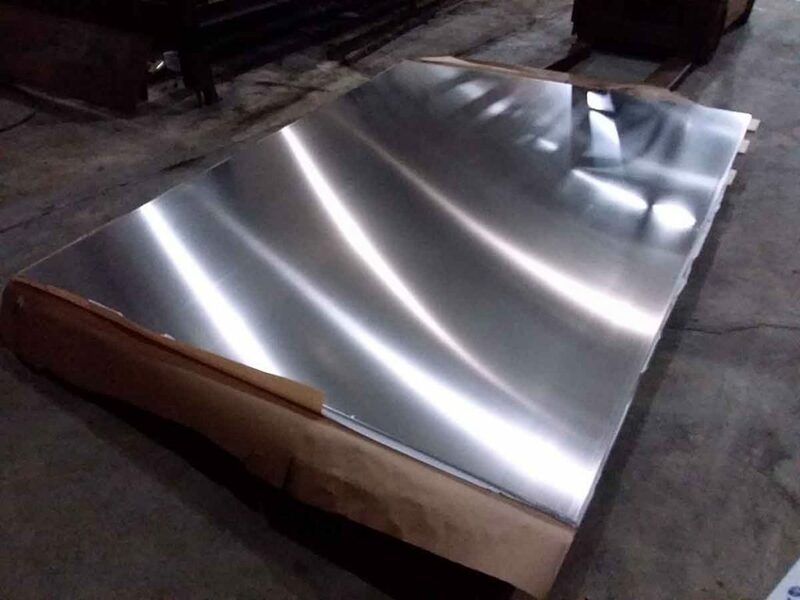 Here are some nice and shiny looking 6′ x 8′ sheets of 3/16″ thick aluminum that we’re using as the canvas for our metal art project. 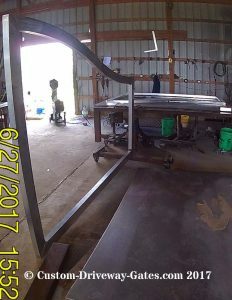 The sheets will be welded into a 2×2″ square tubing frame a little later. 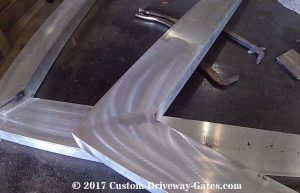 The gate design is going to be cut out on a plasma table. 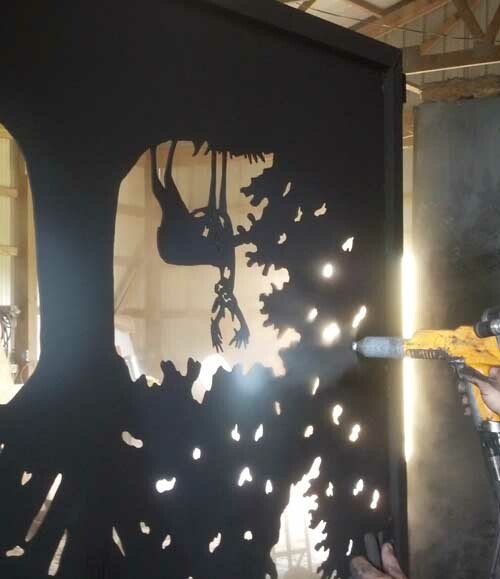 Plasma cutting is a process that we use to turn stock metals such as steel, aluminum or iron into intricate shapes for decorative driveway gates. 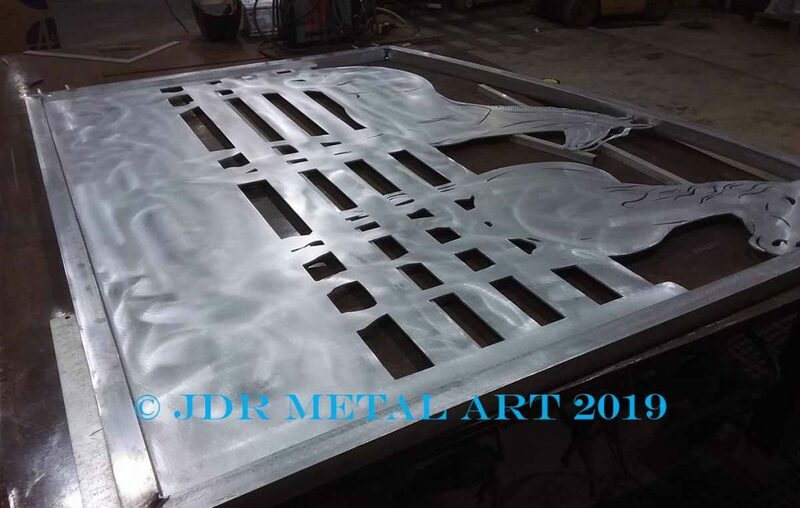 Not only will these gates be decorative, they will also be very durable since we are using 3/16″ thick aluminum which is much thicker than a typical boat hull. 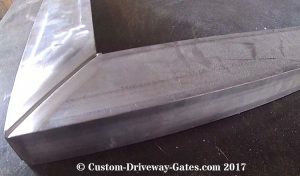 In this video clip you can see what it looks like when we’re cutting aluminum. 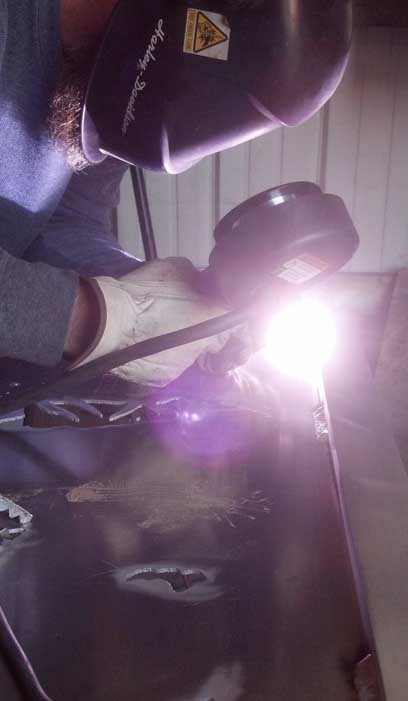 The light from the electrical arc in the plasma torch is very bright and hot, many thousands of degrees of heat and swirling plasma gas creates a clean cut directly through the metal. 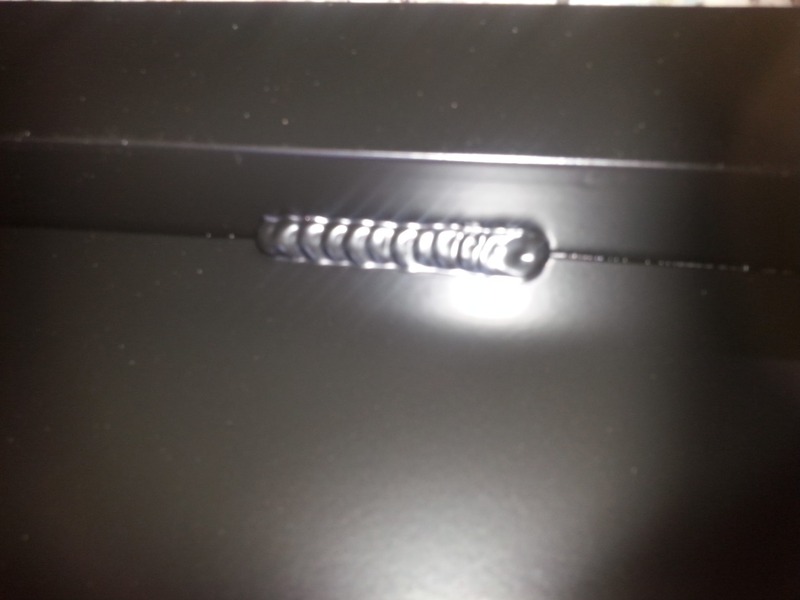 These are dual or double swing gates. 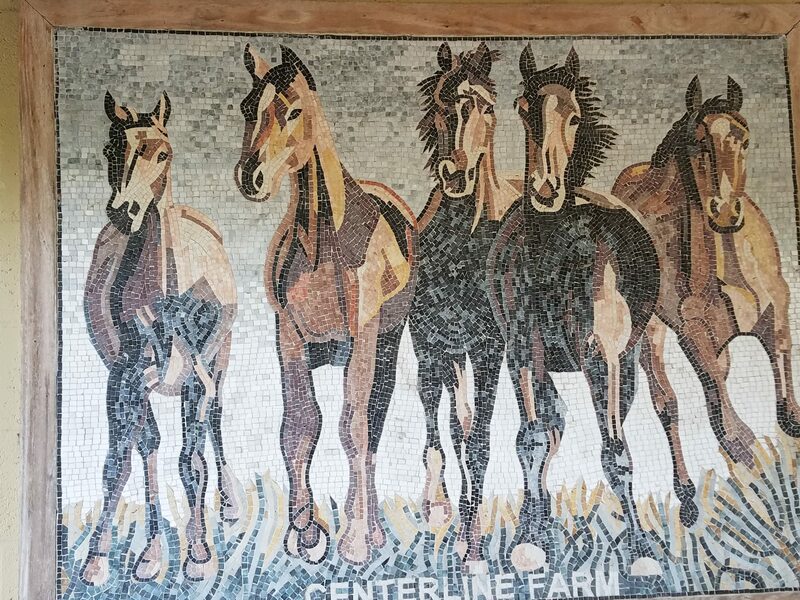 Each panel is 7′ wide. They are also 5′ tall on the ends and 6’4″ tall in the center. 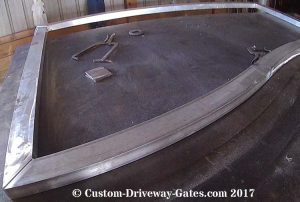 The gate frame consists of 2″ square tubing, 3/16″ wall thickness. 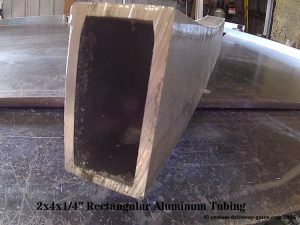 All the ends of the aluminum tubing are miter cut to a 45 degree angle, then beveled prior to welding for maximum strength. 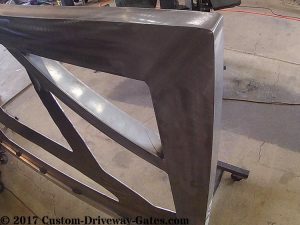 Aluminum is very lightweight compared to steel, not a huge amount of strength is needed at the weldments to ensure these gates will never bend or sag under their own weight. 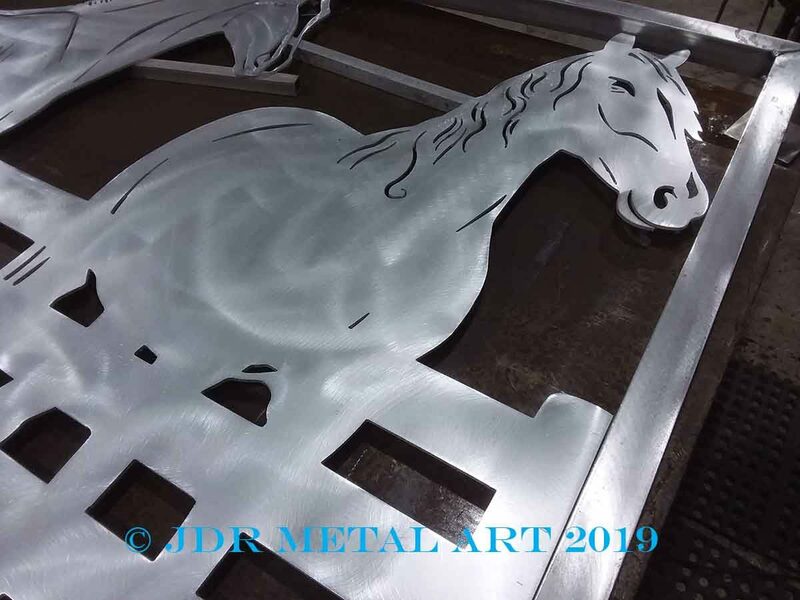 Everything is welded together using an aluminum spoolgun, which is one of the more challenging welding process to become proficient with. 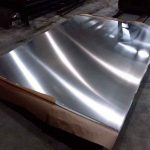 With aluminum fabrication it is important to clean the metal prior to welding in order to achieve the highest strength. 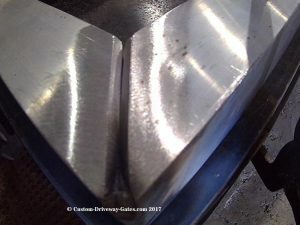 Any oils in the weld puddle can create porosity in the weld and poor fusion of the metals. 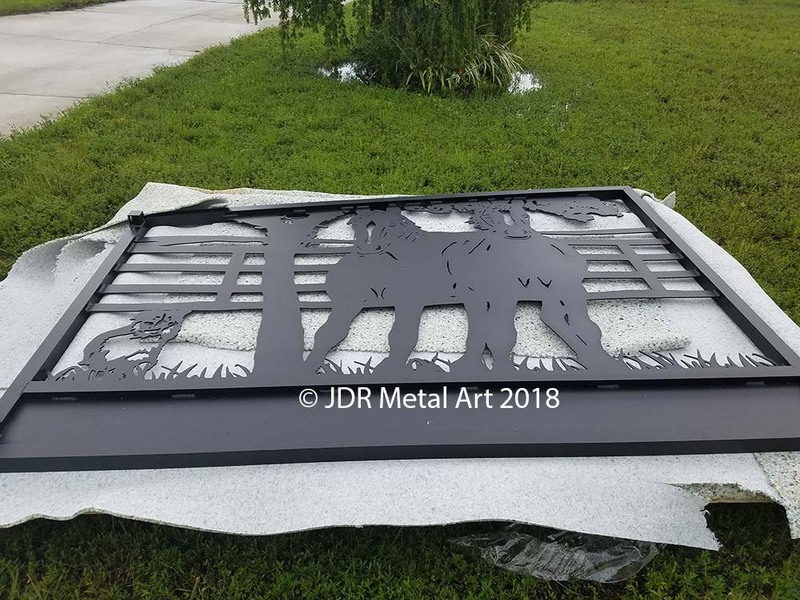 Custom driveway gates in the Tampa / Bradenton area, handcrafted from aluminum by JDR Metal Art. Another time critical project delivered as promised. 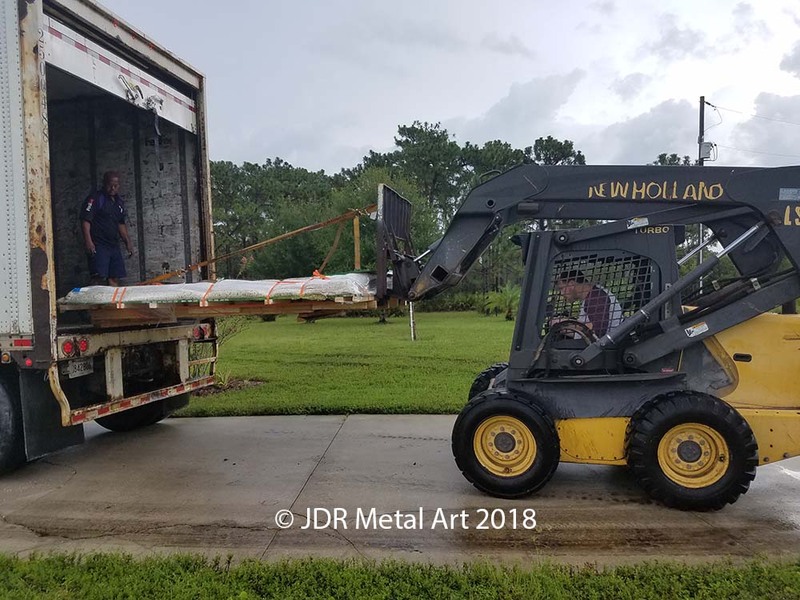 This one went from completed design to residential delivery & installation in 2 weeks, just in time for a special birthday party. 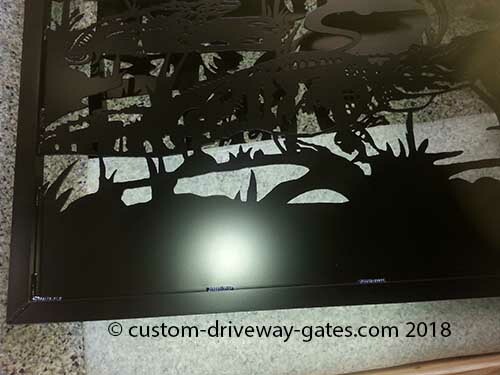 These gates were designed to match our client’s existing mural. 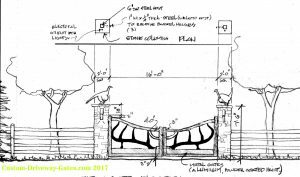 Each gate panel hangs from block columns that have a stone veneer. 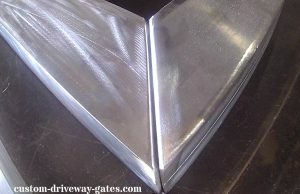 They are automated with Viking gate openers by a local gate automation expert we have worked with on installing numerous gate projects. 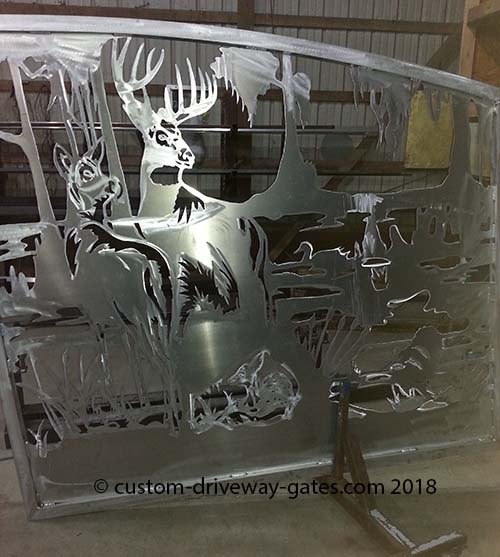 These driveway gates, like all our others, were built to last a lifetime. 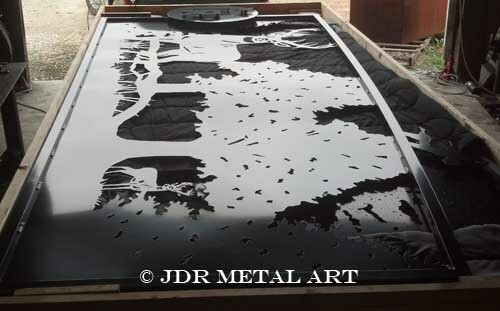 Contact us for a same day quote or give us a call..800 805 8254. 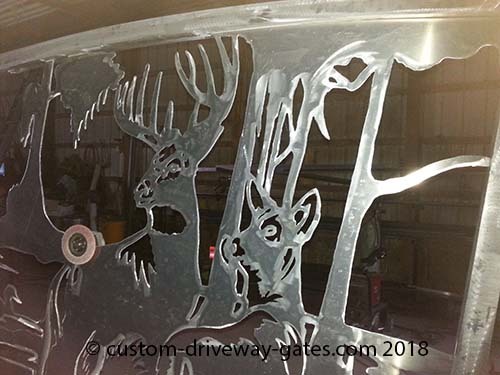 These beautiful aluminum driveway gates were designed, handcrafted and given a beautiful powder coat finish by JDR Metal Art. 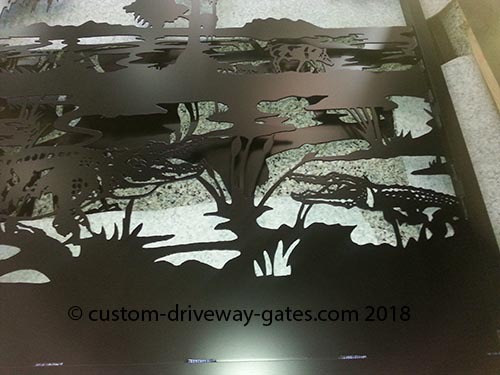 We worked with our West Palm Beach, Florida customer to modify a design for him based on a set of Louisiana driveway gates we had previously built in 2017. 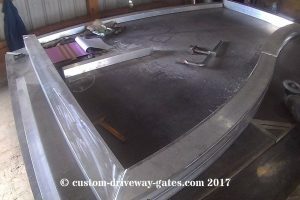 The customer’s driveway entrance is 14′ wide. 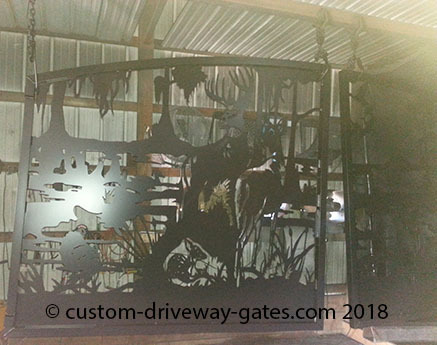 Each gate panel is 6’4″ tall at the peak and 7′ wide and weighs less than 100lbs. 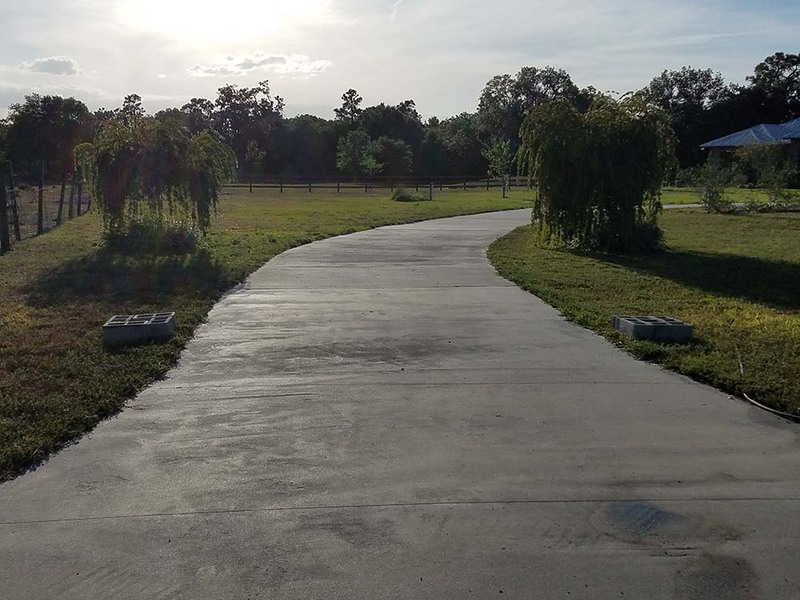 The installation of the gates will be provided by Budget Fence and Gate of West Palm Beach, Florida. 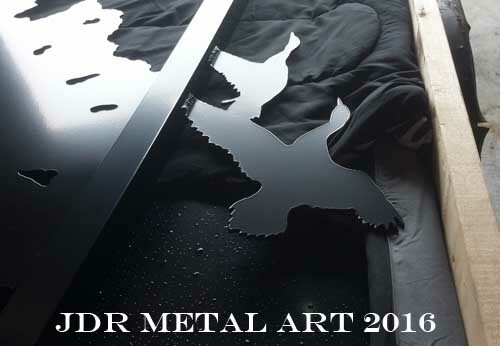 All material, both the square tubing frame and the silhouette art, is very heavy duty 3/16″ thick. 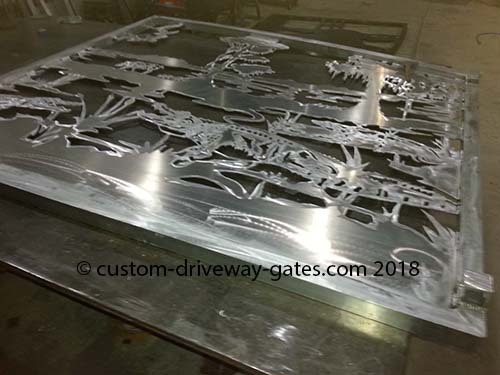 The gate panels will each hang from a stucco finished column for which we also made custom mounting brackets for our super-duty hinges to attach to. 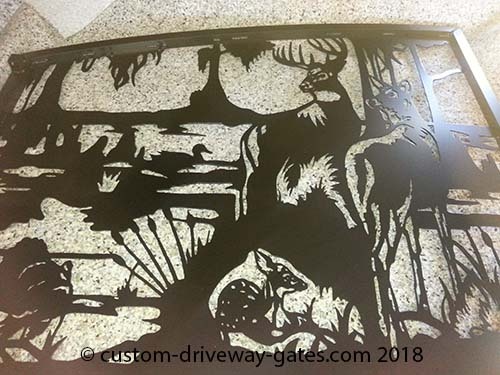 Interested in a custom driveway gate? 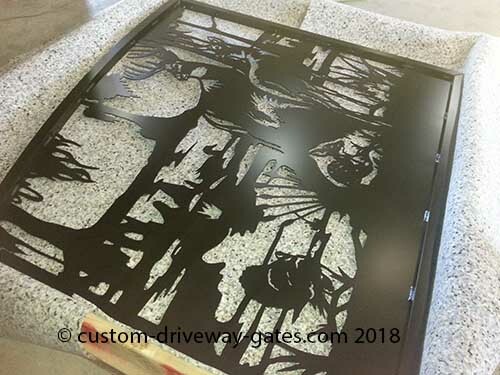 Feel free to contact us to learn more or check out our design info page to learn more about how easy it is to get the perfect gate design for your driveway entrance!